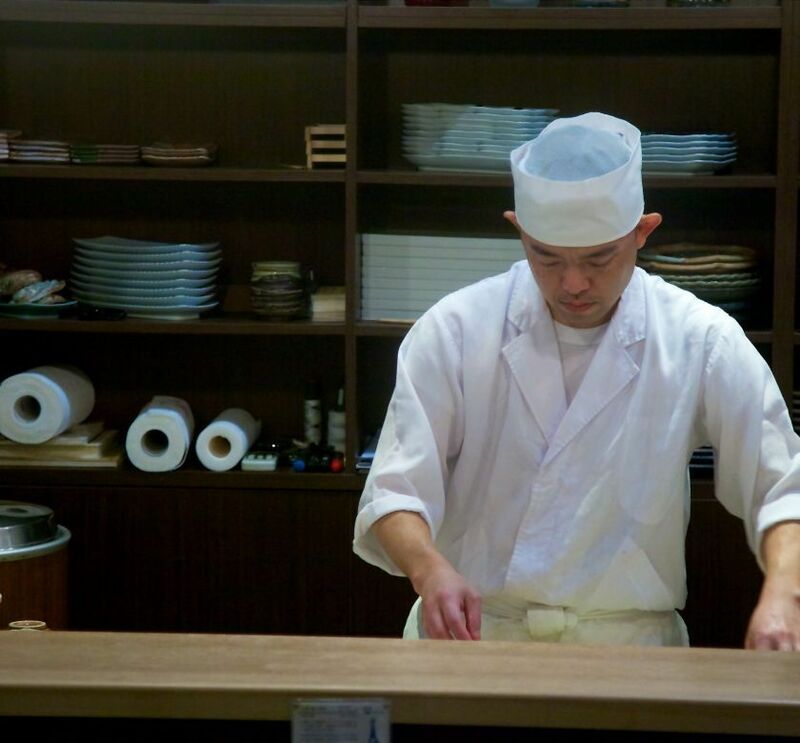 The duck is what 99% of the guests here seem to order, and this success rate has its reasons. It is presented at your table, with golden-brown skin that seems so thin that even a blunt knife would slice through it without any problem. A substantial portion of this skin is served on its own, and you dip the pieces in sugar to enjoy them. The texture is hard to describe: fragile, crunchy, delicate, melting. In the mouth it starts crispy, but quickly melts away in a rich flow of flavour. 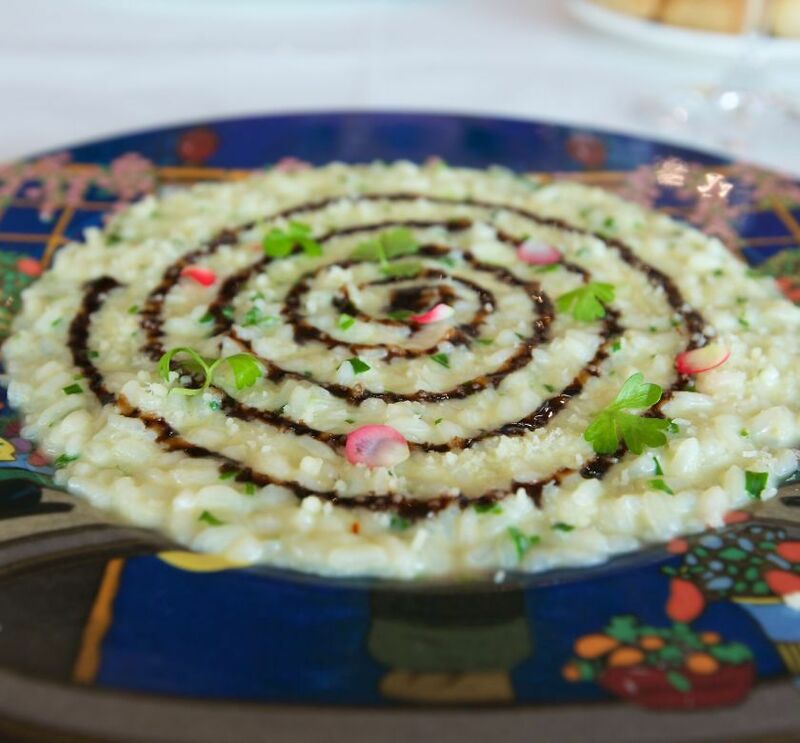 Such a sensation of flavour and texture is quite surreal; it is unlike anything one gets served in the West. This, however, is only the first part of eating roast duck. The second serving delivers duck meat that is well done, but still juicy. Wrapped in paper-thin pancakes, with a little chives, cucumber and sauce, the breast and leg meat are delightful. This is very different from the way of serving duck in European cooking, but equally enjoyable. The final serving is a clear broth made with the bones. Often a little on the bland side, the one at Made in China is more flavoursome, but hardly a blockbuster. 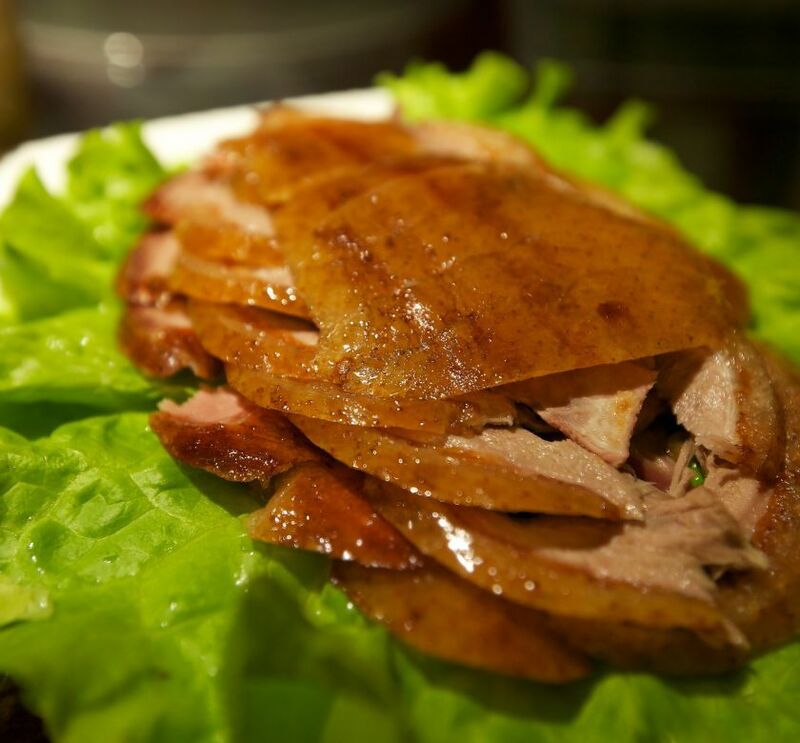 These various servings make up one of China’s most famous dishes: Peking duck. 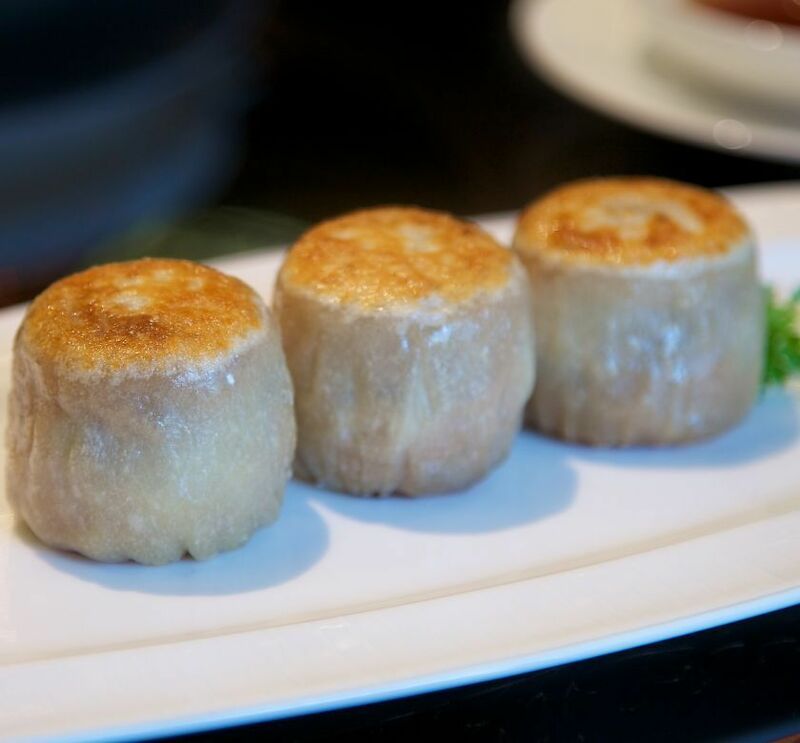 Cooked properly, it can be of incomparable finesse and delicacy, and even in Beijing only a few restaurants pull it off. Made in China is definitely one of them. 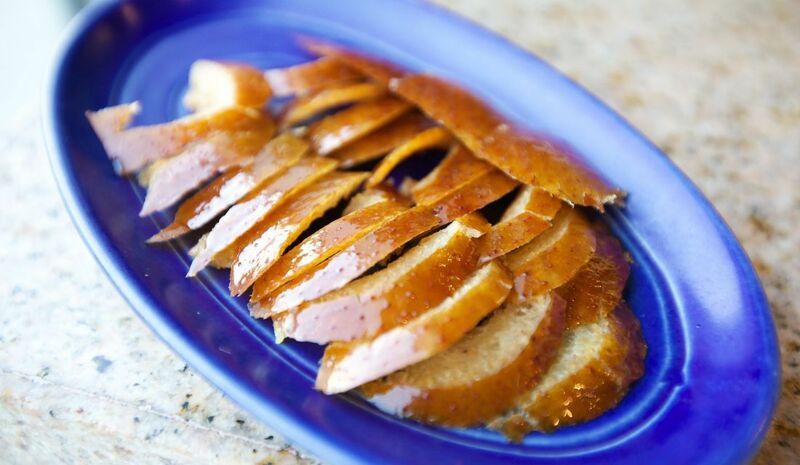 It is one of the very best places to have duck, and the only point of criticism would be the thickness of the pancakes. They are a little rustic, making it more difficult to taste the other elements. Whilst Made in China is famous for its duck, there is more to it than just that. 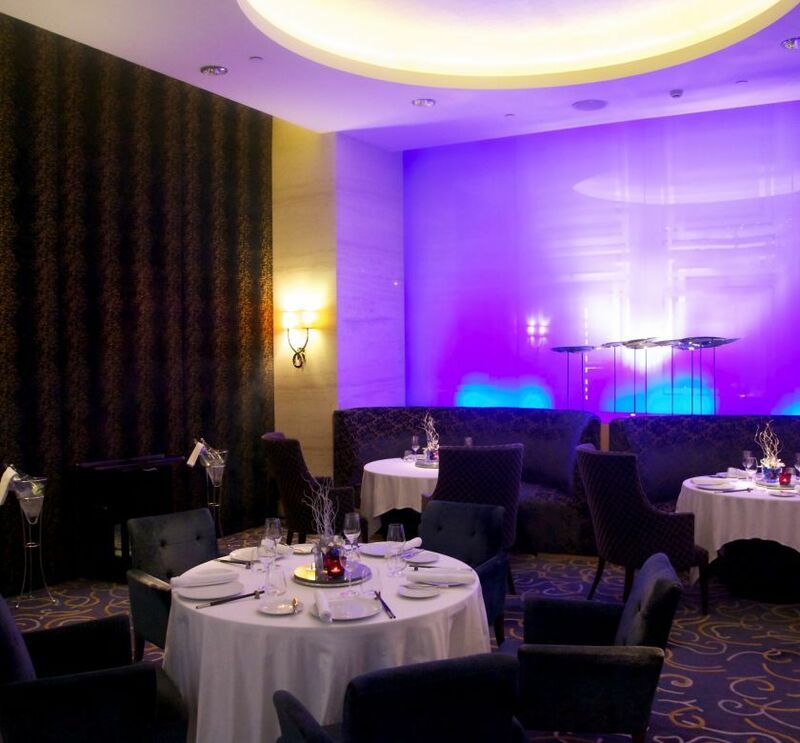 Both the public and private dining rooms are a skilful blend of old and new elements that set the scene. 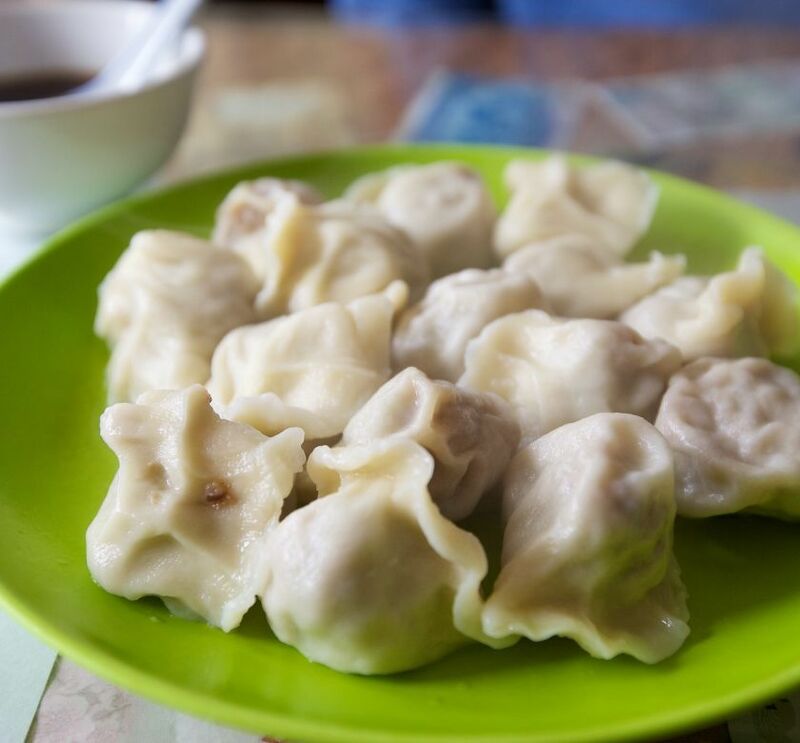 You have the impression of sitting in an (upmarket) hawker centre of sorts, having people cook dumplings or pot stickers on one side, whilst their colleagues across the room fry up some noodles. This is not the youngest of restaurants, and the room starts to show its age a bit. 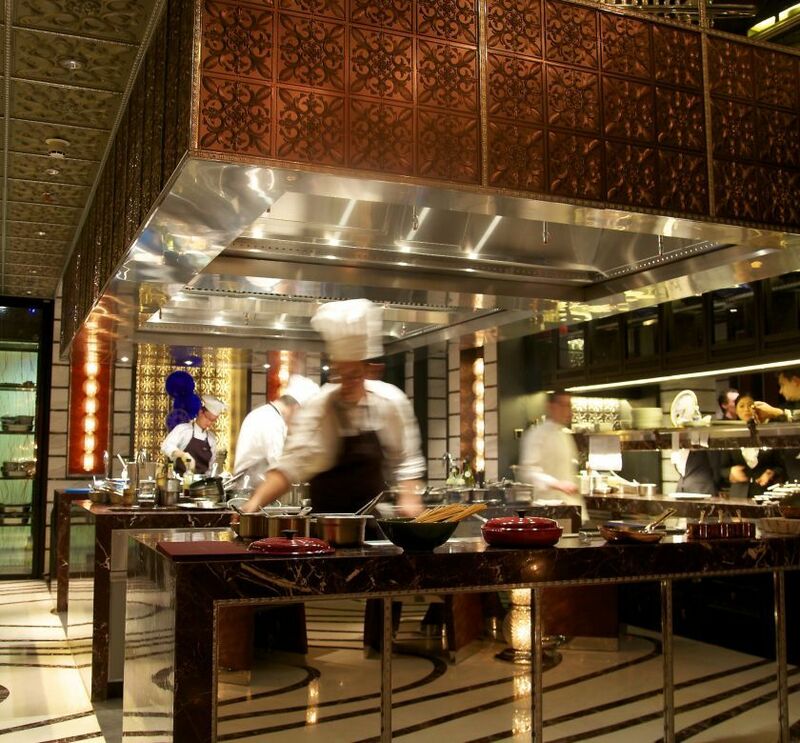 That being said, it is one of the most distinctive places to eat in Beijing, and was a visionary concept when it opened. The service has become less and less professional over the years. Lost reservations, endless waiting times for pre-ordered ducks, and a dining room that is too busy to have waitstaff look after guests properly make eating here more similar to a more humble restaurant rather than a 5* hotel dining room. Luckily enough, the food more than makes up for the service issues, as it is some of the best in all of Beijing. Take, for instance, the braised imperial abalone. A huge abalone is served in its own juice with asparagus. 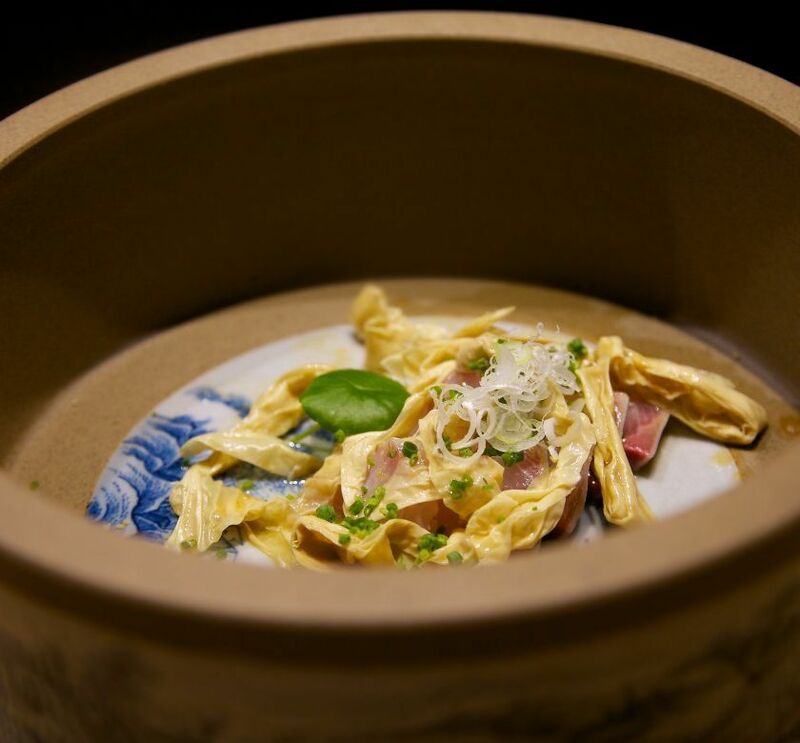 This is a classic that is executed perfectly here: the abalone is meaty both in texture and flavour, works more than well with the braising juices. Again, the texture is what makes this product so special, as Chinese are obsessed with it. However, this kitchen can work with more basic products, judging by the spinach with sesame/wasabi sauce. 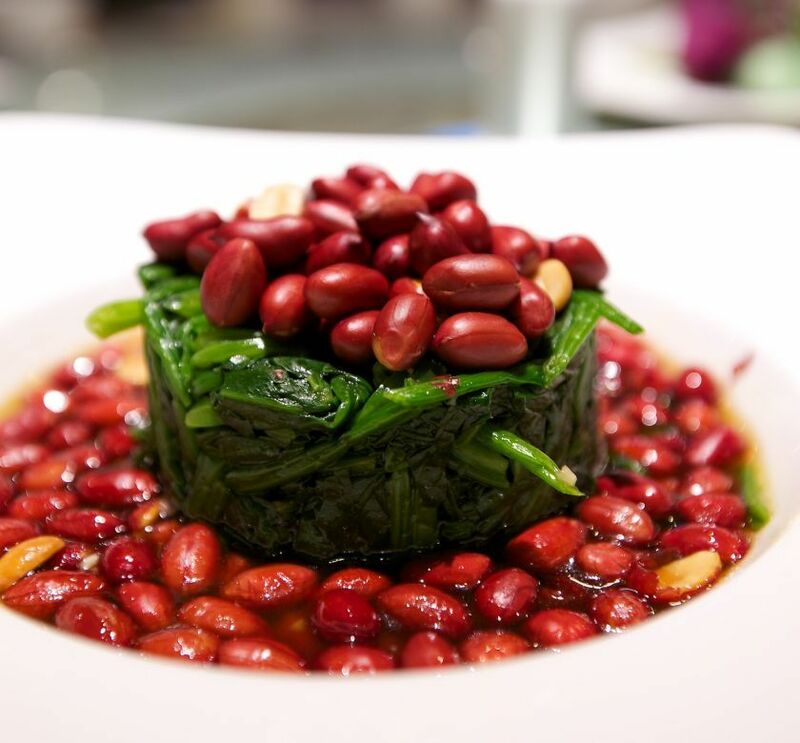 This is really interesting, as the vegetable is laden with flavour, whilst the thick paste of a sauce gives a rich, spicy background to the pressed spinach. This shows how much attention goes into the cooking of vegetables in China. Desserts are no less good, with a version of profiteroles making a very successful end to a meal.